Kathy Clarke has been providing Destination Management services in the Hawaii Travel Industry since 1980, and 40 years of experience have made us Rock Solid! Authentic Polynesian Culture – Enjoy the world’s largest and most spectacular Polynesian revue! Traditional Beachfront Luau – Play island games, learn island crafts, take part in a Hukilau, enjoy the imu ceremony at sunset, a scrumptious island feast and a Polynesian Revue. 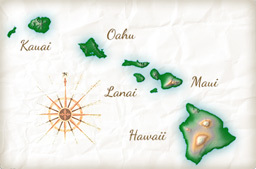 Honolulu Excursions – Visit the many different historical sites within Honolulu city limits. Submarine Adventures – Dive in the world’s largest hi-tech 64-passenger submarine. Fun Ocean Cruises – Every day is summer in paradise aboard one of the many cruises! Whale Watch Cruises – Hawaii is the best place for viewing these magnificent mammals. Sunset Dinner Cruises – Experience the beauty of a crimson sunset at sea on the Pacific Ocean. North Shore Ocean Cruises – Experience the beautiful and famed beaches of northern Oahu, home to Pipeline and other world-famous surfing spots. Water Adventure Park – 25 acres of water fun, includes rides, slides, and oceans of excitement. Kualoa Cultural Tour & Activities – Oahu’s Windward side features a 4000-acre working ranch, featuring activities such as ATV and Horseback riding, Hollywood film locations and water fun on a remote island. Sea Life Park – Hawaii’s marine life comes alive in a dazzling display that will entertain and delight. Helicopter Tours – Spectacular aerial views of Oahu’s beautiful beaches, mountains, valleys and iconic landmarks. Waterfall Hike and Beach Fun – A scenic hike and a dip in the ocean, too! Bike and Waterfall Hike – A bike tour combined with the scenery of Oahu’s majesty. Deep Sea Fishing – Hawaii is one of the best deep sea fishing locations in the world. Ocean Kayaking – Enjoy a great day in the beautiful waters off Kailua, on the windward side. Surfing Lessons – Introduce yourself to the “Sport of Kings”. Dinner Shows and Events – SOS Dinner and Show; Magic of Polynesia; Cirque Hawaii; Oahu’s night life offers an array of entertainment for all tastes. Oahu’s Museum and Attractions – Countless historical and cultural attractions for all types of inquiring minds.